If you’re tired of ‘land-fill’ toys taking up valuable space in your home, you’re going to love the products from French company Carton Chic. We love them so much, we’ve featured them back in December ’07. Created in order to develop cutting edge, environmentally-friendly products, Carton Chic products are made using either recycled cardboard or materials that come from PEFC or FSC forests. How awesome is the My Bio Little Market cash register? Flat-packed for your convenience (and cheaper shipping! ), the register comes with accessories such as coins, sushi tray and milk. It can either be used as a decoration or to train your child for their first after-school checkout job. Hey, it’s never too early to learn! 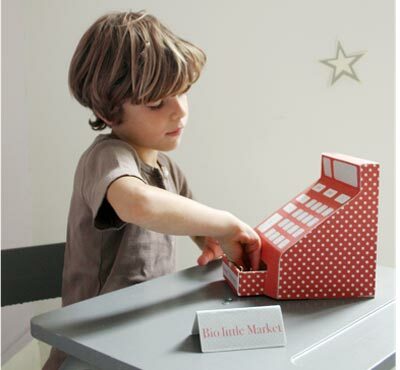 Made from recycled cardboard, the My Bio Little Market can be yours for €18.50. You can purchase one from Little Fashion Gallery which ships internationally.